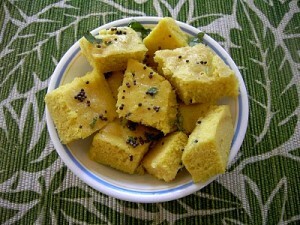 Dhokla recipe by Nazia Nazar at DesiRecipes.com. Mix chili and ginger in the gram flour and add a little water into it. Mix well till smooth. Combine sugar and citric acid in a cup and add 1 tbsp of water. Place soda bicarb in another cup and pour a tbsp of the water over it. Place the pressure cooker on stove with 1 litre water and let it start to steam. Grease a cake pan and place in the cooker. Add sugar solution and color to the batter. Mix well till light and fluffy. Add soda solution and mix well. Immediately pour the mixture into the pan before the foam goes down. Cover pan with a perforated lid and close cooker. Cook without whistle for 13-14 minutes. Remove the container and allow it to cool. Cut in cubes and remove with spatula. Heat oil in a small pan. Add mustard seed , allow to splutter. Sprinkle cilantro leaves. Transfer to serving dish. Serve hot or cold with green chutney.